Read more about these applications on our Cedar Lake Project Website at http://cedarlakealum.com/. Cedar Lake is a 1,118-acre recreational lake near Star Prairie, WI with a maximum depth of 34 feet. Cedar Lake has been on the Wisconsin list of impaired waters since 1998 because of high total phosphorus levels. The lake is eutrophic to hypereutrophic with summer algae blooms that result in odors and unsightly build-up of algae along the shorelines. The lake is phosphorus limited: it is the concentration of phosphorus which controls the level of algae growth. Impairment of recreation uses was added to the list of water quality concerns for Cedar Lake because of excess algae growth in 2012. Cedar Lake algae blooms have been documented since the 1930s. Copper sulfate was used on the lake since the 1940s to provide short term relief of nuisance blooms. There has been an increase in phosphorus in the lakebed sediments over the years and they release phosphorus when oxygen levels decrease at the lake bottom. The water column of Cedar Lake periodically mixes during high summer winds and cool conditions, bringing phosphorus-rich water to the surface for algal uptake and growth. In addition to this internal loading of phosphorus, phosphorus input to the lake comes from the watershed and direct rainfall, along with minor inputs from groundwater. Samples from the bottom of the lake confirmed that phosphorus was very high in the sediments and available to be released into the overlying water column. 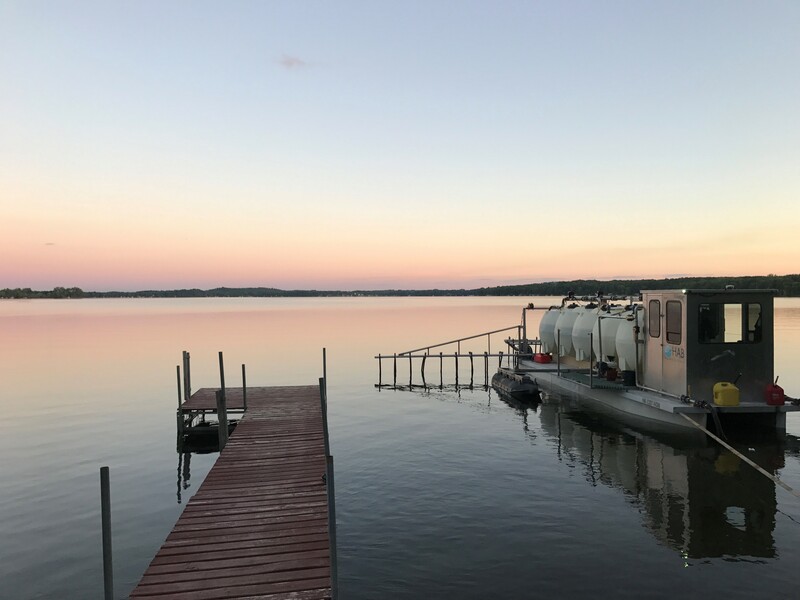 In June of 2017 HAB applied a partial dose of over 285,000 gallons of alum to the lake.